In our contemporary life, transitioning from one event to another often occurs with ease and little reflection. We enjoy the thrill of the moment without paying attention to every detail. The fervor of a birthday celebration, for example, soon gives way to the excitement over the family graduation or another emerging fiesta. In short, our lives reflect a series of historical, social and political happenings that seem to come and go out of our lives with little pause for thought. Yet, there are also times when these familiar and cyclical events linger in our hearts and imagination, opening up for us thresholds of new emotional and spiritual meaning. And when this happens, we experience an occasion for deeper reflection and self-awareness. This is particularly the case with our religious celebrations. In faith, we know that these seemingly ordinary events are opportunities for greater insight. Recently, we celebrated Pentecost Sunday in our Church. Like many other cyclical feasts in our liturgical calendar, this day of the Holy Spirit marks our beginning and mission as people of God. So, we listened to the affirming images and language of the readings that spoke about the different gifts bestowed on us by the Spirit. In their message, the image and reality of being one body in the Lord was evoked. And we were commissioned, anew, to go beyond ourselves and into the world with the Spirit of peace and forgiveness. Far from being a passing event, the celebration of Pentecost is an ever-present reality of how much God has done for us. “Then there appeared to them tongues as of fire, which parted and came to rest on each one of them. And they were all filled with the Holy Spirit and began to speak in different tongues, as the Spirit enabled them to proclaim” (Acts 2: 1-11). Indeed, Pentecost empowers us to hear and remember in the language closest to our own heart the mighty acts of God. In the same Spirit of Pentecost, we become capable of proclaiming who we truly are before God and the world. And the Spirit gives each one of us what we need in order to be renewed in our service and care for one another: “There are different kinds of spiritual gifts but the same Spirit; there are different forms of service but the same Lord; there are different workings but the same God who produces all of them in everyone. To each individual the manifestation of the Spirit is given for some benefit” (1 Corinthians 12:3-7; 12-13). While our preference may be to proceed to our next liturgical celebration or cultural event with ease, it’s advisable to pause and reflect on the potential discomfort brought to us in the fire of the Spirit: A discomfort in the Spirit, beckoning us to be prophetic agents of healing, reconciliation and unity in a Church and society hardened by divisions. “Jesus said to them again, ‘Peace be with you. As the Father has sent me, so I send you.’ And when He had said this, He breathed on them and said to them, ‘Receive the Holy Spirit.’” (John 20: 19-23). I suspect that for each one of us the impact and meaning of Pentecost Sunday will continue to unfold differently in the coming days and weeks. I invite us to linger on the words we have heard, and the message it offers of remembering, renewing and rejoicing in our identity in the Lord. Only by dwelling in the Spirit can we go forth as missionary disciples full of humility, confidence and trust. 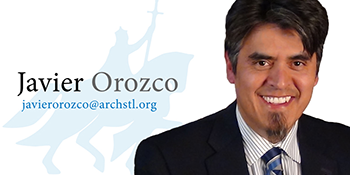 Orozco is executive director of intercultural and interreligious affairs for the Archdiocese of St. Louis.